Become a Lifeguard this Summer! Being a lifeguard is more than just knowing how to swim, it is truly one of the most rewarding jobs! Along with staying fit, saving lives, and enjoying the outdoors, lifeguards gain useful life-skills through this prestigious job. 1. Teamwork / Team-building – Becoming a lifeguard means becoming part of a team. Lifeguards form solid bonds and friendships. They learn to trust their coworkers as they can’t do any type of water rescue alone. In order to work effectively together, they must learn to trust their team as well as one another’s judgment. 2. Leadership – Along with teamwork skills, lifeguards gain leadership skills. Lifeguards must be completely confident in their individual strengths so that that they can prevent an accident. Being a certified lifeguard shows confidence and self-esteem in decision-making. 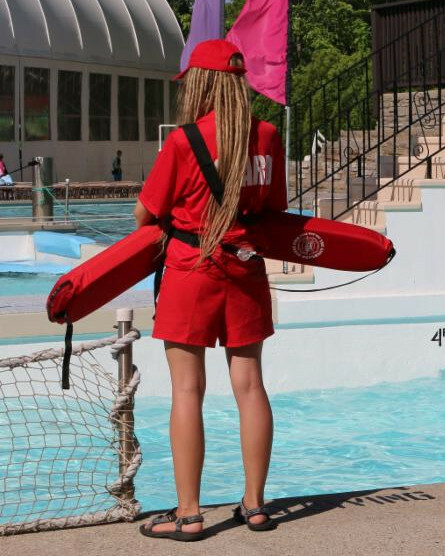 Lifeguards are required to take charge of an emergency situation and are taught that prevention is key and that they must be able to see an emergency before it becomes one. 3. Professionalism – Lifeguarding is great for resume building / college application. Lifeguarding demonstrates to future employers and schools the strength, drive and ability to hold an esteemed job. Being hired as a lifeguard proves that one can be expected to show up at work on time, in correct uniform with the proper mental attitude. Another important aspect of professionalism for lifeguards is the ability to educate and enforce patrons on pool and water safety. Educating is essential to preventing accidents from occurring. If a lifeguard sees a child misbehaving in the water, they can explain the rules and educate them on the reasons behind the safety measures. Click to learn about our American Red Cross Lifeguarding Course.